Parents are often left wondering if their child’s argumentative, limit-testing, back-talking, rule-breaking behavior is “typical” teen or pre-teen defiance—or if it’s something else. Clinically speaking, Oppositional Defiant Disorder (ODD) is “a pattern of angry/irritable mood, argumentative/defiant behavior or vindictiveness lasting at least six months.” But what does that mean, exactly? If an image of constant chaos and conflict comes to mind, your child may have ODD. Parents of children with ODD say that their child frequently argues—with authority figures such as parents, teachers, or any other adult—and often refuses to follow or “defies” rules, at home, school, or other places where there are behavioral expectations. They often report that their child deliberately annoys others, especially siblings, and blames his or her behavior on others. Their child may exhibit touchiness, irritability, or full-blown anger and resentment on a regular basis, especially if faced with a rule, limit, or stressful situation. If asked to do something that he or she doesn’t want to do, the response is usually outright refusal. Limit-testing behavior crosses into ODD when it becomes a frequent pattern and continues in the face of consequences or redirection. Isn’t “Challenging Authority” Normal for Puberty? Testing limits, fighting for independence, and separating identity from parents is all very typical of adolescence and pre-teens. At this age, information from peers, media (especially social media), and other sources start to take precedence over parents. The child that once asked you about everything (“Mom, how do they make airplanes fly?”) may seemingly decide overnight that you now know nothing. And there’s a tone to your child’s voice—a sort of derisive, impatient, condescending tone—that lets you know your child is evaluating you constantly and finds your intelligence and skills to be lacking. This is “normal.” It’s not pleasant, but it’s normal. Adolescence serves two purposes: You irritate your children enough that they want to move out of your home to live independently, and they get on your nerves enough that you’re fairly happy to see them go. Limit-testing behavior crosses into ODD when it becomes a frequent pattern and continues in the face of consequences or redirection. Is it ODD or Something Else? At the other end of the spectrum, you have Conduct Disorder: behavior that is so negative and dangerous, it is aggressive, illegal, or exploitative of others, and lacks remorse or empathy. If you’re afraid or intimidated by your tween or teen, worry about the cops coming to your door because of trouble he’s gotten into, or if she’s been expelled for bullying peers or taking a weapon to school, your child’s behavior has now moved into Conduct Disorder. 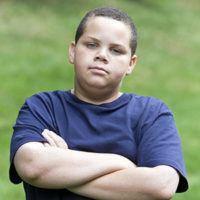 Conduct Disorder is a pervasive pattern of violating the rights of others. In the middle is Oppositional Defiant Disorder. Not the worst behavior, but certainly not the best. If asked to rate the severity of your child’s behavior issues on a scale of one to 10, and you reply anywhere from five to eight, you’re probably dealing with ODD. ODD can leave a parent overwhelmed, exhausted and disheartened. It does not leave a parent scared or frightened their kid will seriously hurt someone. These distinctions are important when it comes to correctly diagnosing and intervening in a pre-teen or teen’s behavior. And a correct diagnosis allows mental health professionals to determine what type of interventions would be most helpful in treating the symptoms that are causing distress. It’s important to remember that ODD can “look” different depending on the child. Just as your child’s personality is unique, so too are the signs of ODD. 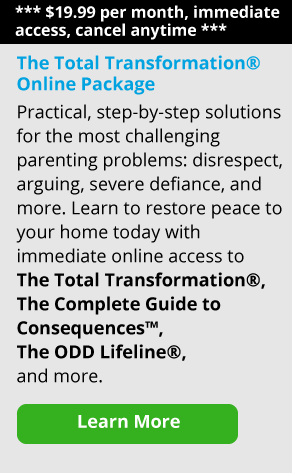 When we think of ODD, we often picture an angry, arguing teen, yelling at a parent in defiance. But some teens are, instead, “politely defiant.” Any time 14-year-old Jack’s mom or teachers asked him to do something he simply replies “No, thank you.” No yelling, no arguing, just no. So defiance can range from polite to furious and anywhere in between. Whenever a mental-health professional seeks to diagnose a child or adolescent, the first step is called differential diagnosis: determining what diagnosis best accounts for what we’re seeing. Behavior that looks like ODD can stem from a variety of factors, including a history of abuse or trauma, anxiety, Attention Deficit Hyperactivity Disorder (ADHD), or medical conditions. Some kids with chronic illnesses, allergies, or other issues just don’t feel well. They may not know why and often aren’t able to put into words what’s going on inside. Before making a diagnosis of ODD, it’s important for parents and health professionals to look at the whole picture. ODD does often go hand-in-hand with some of the conditions mentioned above. Your child, for instance, may be experiencing both ADHD and ODD. And sometimes oppositional, defiant behavior can actually become a habit. For example, a child is anxious or worried, refuses to do something when asked, starts arguing with a parent, and over time, gets used to dealing with stress or limits in a way that is oppositional. ODD behavior can leave a parent feeling misunderstood, resentful, worried, and fearful for their child’s future. But there is hope. Many successful people in this world were oppositional and defiant during adolescence. The same traits and characteristics that are so frustrating for parents often serve kids with ODD well in achieving their goals later on in life. Remember, we at Empowering Parents truly understand and are here to support you; you’re not alone, and there are tools that will help you manage and survive this challenging time.